SHIP'S LAUNCHING AND PLANT A TREE YEAR. 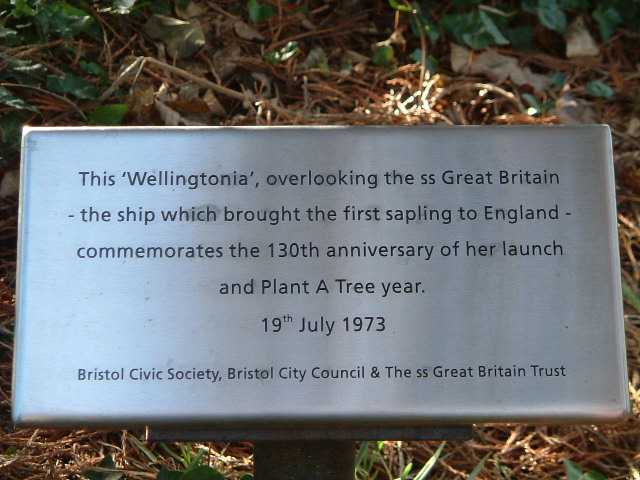 At the time I was secretary of the Bristol Civic Society, who had the initiative for the tree and plaque; they paid £40. They also had the initiative to found the 'ss Great Britain for Bristol Committee' and handed to me the task of setting this up. 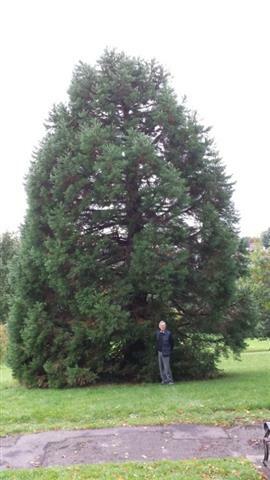 My wife scoured southern England to find a container grown Wellingtonia which could be planted in high summer. One was eventually located at Hilliers in Winchester - cost £5. 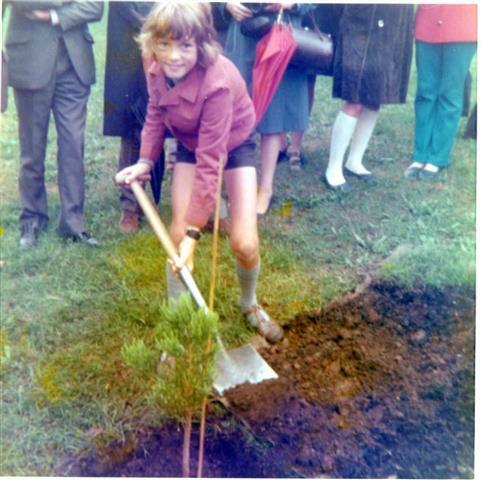 The planting ceremony took place as described, although my 10 year old son Robert actually did the planting, with black & white photo evidence in next day's Evening Post! The tree was originally about 3' tall. Today, over 40 years on, the ship has changed dramatically, the tree is about 60' tall and my son 6'5"! The original plaque 'disappeared' some time in the 1980s. I replaced it in the early 90s, but it went again. Many years later it was found hidden in the dense undergrowth beneath the tree, apparently having fallen off the stand. Some years ago I approached the City with a request for another replacement - according to the Public Monument and Sculpture Association National Recording Project they have 'a duty of care'; they said they had no money and that I should approach the ssGB. This I did. Eventually they supplied a new plaque, but with much attenuated text. 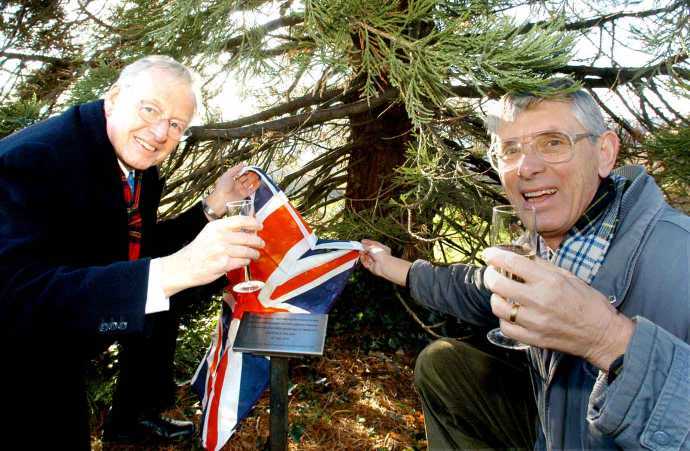 The new plaque was installed on 29th November 2004 with many of the people who had attended the 1973 ceremony able to attend. Prior to this, in 2001, I had obtained a quote of £195.00 +VAT for an 8"x6" bronze plaque, but this quote was not accepted. In October 2013 my son came home for a few days. We visited the tree and there was no sign of the plaque; in fact, the whole base of the tree was overgrown with brambles, etc. However, we found the gardeners' hut and they told us that they had the plaque, which had fallen out of the ground some years earlier; they were waiting for someone to pay for it to be replaced! We gave them the required fee. They promised to clear the undergrowth and replace the plaque in a proper cement base. A few days later they sent me photos of the cleared base and the replaced plaque. Wonderful. I write because this story is in the process of being lost. It now only really resides in my family's memory.